Last week I had the immense privilege of visiting a school through the sponsorship of Books For Me, a non-profit organization dedicated to helping needy schools provide books and other resources to students. Every month, Books For Me comes to various schools and sets out an array of donated books, and the children each get to choose one to keep. Every month. In the library with the students of Admiral Seymour Elementary. 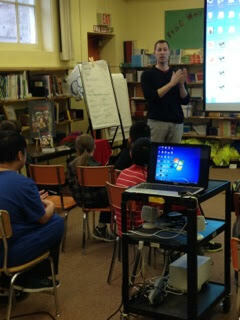 In addition, Books For Me sponsors schools to allow them to arrange author visits at no cost to the school. This provides an exceptional learning experience for students who might otherwise not have such an opportunity. I really encourage everyone to support this worthwhile organization. Go to their website linked above and see what they're all about. There is information on the site if you are interested in donating.